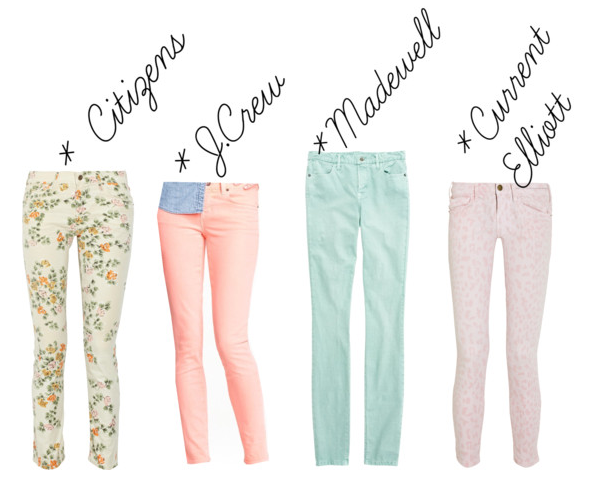 I have been longing for some cute pastel jeans lately myself! These are pretty picks. I'm such a fan of colored denim. The color of the Madewell pair is so pretty! i LOVE colored jeans! i've been eyeing a pair of red jeans but can't decide if i can pull them off...i just need to take the plunge! Seeing you at school today reminded me that I needed to look on your blog for some fashion advice! I'm so glad I'm not the only one still wearing my white jeans! :) You look so much cuter than I do though! Have a great 3 day weekend! Ali: You're so sweet to read! But I must say there's NO WAY I could ever look cuter than you (even if I had a stunning baby on my hip!). Enjoy the break! I have those Madewell and craving on the J.Crew. Such a cute blog!! Definitely gonna start following.